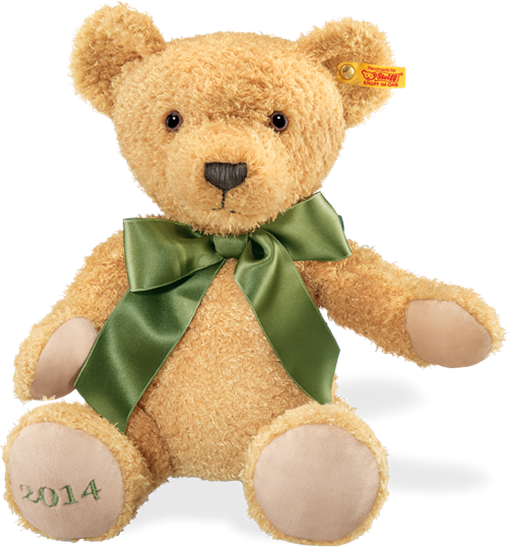 This is a super soft plush teddy bear with the year 2014 embroidered on its paw.. This cosy chap embraces all the traditional ingredients we love about Steiff but he is also so soft and has a huge hug big enough for every one of every age. With the year 2014 embroidered on his foot pad, he provides the perfect gift for so many occasions celebrated throughout the year. Around his neck he wears the most dapper green satin bow. He has a friendly face that is easy to fall in love with. Sewn from cuddly soft tan plush, he measures 14 inches. Whether a gift or a companion, he will always be your friend for life. He has the yellow tag "Button in Ear" .